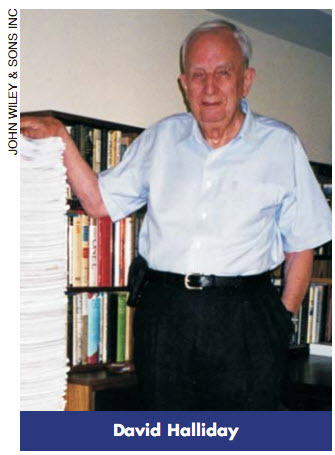 Halliday (1916-2010) was an American physicist widely known for his physics textbooks, Physics and Fundamentals of Physics, which he wrote with Robert Resnick. Both textbooks have been in continous use since 1960 and are available in twenty languages. Halliday attended the University of Pittsburgh both as an undergraduate student and a graduate student, receiving his Ph.D. in physics in 1941. During WWII, he worked at the MIT Radiation Lab developing radar techniques. In 1946 he returned to Pittsburgh as an assistant professor and spent the rest of his career here. In 1950, he wrote Nuclear Physics, which became a classic text and was translated into four languages. In 1951 Halliday became the Department Chair, a position he held until 1962. Physics has been used widely and is considered to have revolutionized physics education. In a five-volume set revised by Jearl Walker, and under the title Fundamentals of Physics, it is still highly regarded for its clear standardized diagrams, highly readable pedagogy, outlook into modern physics, and challenging, thought provoking problems. In 2002 the American Physical Society named the work the most outstanding introductory physics text of the 20th century.